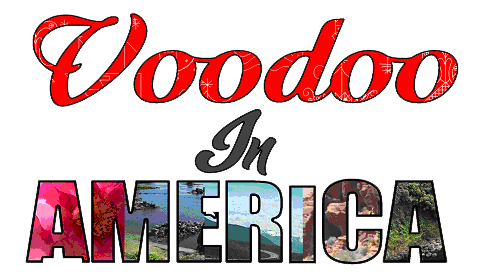 “Voodoo In America” is an art exhibit designed to show the beauty and the healing power of the traditional religion of Haiti, Haitian Voodoo – dispelling the myths and misconceptions that have been created by society and Hollywood. This interactive exhibit is a replica of a Haitian Voodoo Sanctuary, inspired by LePeristyle Haitian Sanctuary, the first 501c3 church of Voodoo known as “the world’s center for Voodoo” established by world-renowned Haitian Voodoo High Priestess, Gro Mambo Angela Noványón Idizol (www.gromambo.com). Within the exhibition, there will be explanations of the 7 African powers know in the Voodoo Religion as “Holy Loa”. One may refer to the Loa as the Holy Spirit, guardian angels, messengers of God or the saints. There are shrines within the exhibit that explain more about these forces of God and their purpose in healing and helping the people. There is also a table with “packettes” and “ceremonial flags”. 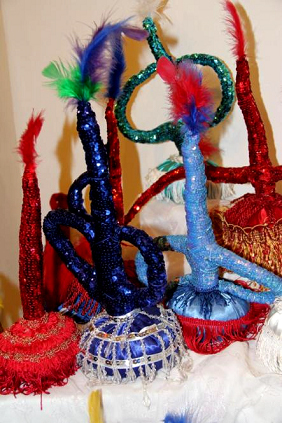 The “packettes” are replicas of real packettes made for High Priests and Priestesses during initiation. This is where the myth of the Voodoo doll can be explained as just that, a myth. The packettes are placed on a four-foot table with levels to create different heights for display purposes. Around the table, you will find 5-7 ceremonial flags that can remain around the table or can be hung to see the beauty of the flags. There is a divination station that consists of a triangle table, a divination tray, cards, a faux perfume bottle and a faux bottle of rum – all of which can be placed wherever is feasible, however not hidden. Copyright © 2013-2019 LePeristyle Haitian Sanctuary, Inc. All Rights Reserved. Site by Blakskorpion Designs.